The Dr Rogo Bunion Splint is great for bunion toe correction, alignment for crooked toes and relieving big toe joint pain. Soothe your sore feet, ease foot pain and prevent bunion surgery. For pain relief, protection and correction in one splint-Each package contains 2pc. one for right foot and one for the left. Designed to be so comfortable you’ll wear it more often made with breathable material. In a discussion between my friends about bunions, my friend recommended this bunion splint to me. I had literally tried every bunion pain relieving product out there, yet, still hadn’t found one that completely took care of the bunion pain I was suffering with. That being said, I didn’t see why this bunion splint should have been any different. But I decided I’d give it a chance anyways. I am here to tell you, I’m thrilled with the results of this extremely comfortable bunion splint! I’ve seen great improvement in my big toe alignment and find the actual splint material very durable. I’m so happy to finally have a solution to heal my bunions! I’m completely amazed by how much these bunion splints have cured my long grieving bunion pains. I started wearing this bunion splint just a short two week ago and have seen so much improvement! I also find the material exceptionally comfortable. After suffering from bunion pains for a while, I decided it was time to look for a solution. I looked into bunion surgery and found it quite costly. My doctor recommended this bunion brace to me. I have been using this bunion brace ever since, and I am exteremly pleased with the results. 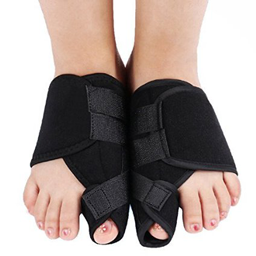 I find the brace most comfortable worn together with slippers or the like, giving space for my feet to move around while applying the bunion brace. I researched every product, And didn’t want to pay fifty dollars for one when I needed them for both feet. So I decided to try this one, even though it had no reviews at the time. And I’m glad I did. I can walk around normally and even wear them with slippers. It actually pulls my big toe away from the others and is extremely comfortable. I strongly recommend this union splint considering you get it for both feet. I usually wear them all day and night if I have no plans. And I can feel a significant difference. I found this bunion brace really useful and made of a strong material. I generally wear them around the house with slippers. After wearing them for a month, I was shocked by how much this bunion brace healed my bunions. Until now, I thought I would have to go through bunion surgery to correct my bunions. Thankfully I discovered this amazing product first! I’ve had bunions for a long time and they’ve caused me a lot of pain and created major balance issues in my daily life. The wearing of a Dr. Rogo Bunion Splint has helped increase my quality of life and has ensured that the joints in my foot become correctly aligned once more. They have provided me with relief that I’ve been plagued me for several years. They aren’t the pretty things to look at but they work and that’s what counts to me. I was considering surgery but I was looking at a surgery bill of around $3,000.00. In my research, compared to other forms of bunion treatment, the bunion splint is the least expensive to use. The bunion splint is very easy to use. I simply placed the splint around my foot and once in the correct position, I secured it with Velcro, and this ensured that the joints within my foot become correctly aligned. I felt relief almost instantly from the symptoms associated with my bunions. The splints are very convenient to use. They can be used over and over again as long as you take care of them correctly. I washed my splints periodically and let them line dry. I’ve been wearing them for two weeks and I can’t believe how much of a difference they’ve made in my reduction in pain and quality of life. I’ve tried other splints but prefer these over others because of the quality, ease of use and comfort. I’m giving this product a 5 star rating because of the quality, clever design, ease of use, and most of all-pain relief! Dr Rogo Bunion Splint, Bunion Corrector for Crooked Toes Alignment & Big Toe Joint Pain Relief Soothe Your Sore Feet. It reliefs Foot Pain. My Husband has so many problems with his feet. This Bunion Corrector is different from others we had. It goes almost over the whole foot and helps correct the crooked toes. His Big and the other toes are crooked. It hurts so much. Im glad we got this Product . He wears it when he comes home from work ,and after wearing them for just two weeks he sees a significant difference already. His pain is reducing day by day. It is comfortable for him to wear, its like a soft cushion and has straps that hold it in place. The package contains 2 of bunion braces. He also finds the material comfortable to walk in. Wash it in warm water with soap, let it dry and wear it again. I’m pleased to say that I found this amazing brace really comfortable for my bunion toes. Finally being able to have a solution to control my bunion pains feels great. The brace functionality is really simple and user friendly. I’m very happy with this purchase. These come well packaged in a plastic bag. The splints are made out of a soft, felt-like material, are lightweight, and feel good on your feet. They come with easy to understand steps as to how to fit on your feet, and the Velcro straps are strong and well-sized to keep the splints securely in place as you sleep. I’ve seen great improvement on my bunions and now feel more mobile capable. All in all, it’s a great value! This was my second purchase from Dr Rogo. My first purchase was the Bunion Gel. It worked great in relieving my bunion pains and so I decided to give their Bunion Brace a shot. Firstly, I found the brace very comfortable to wear! The material is soft and comforting. 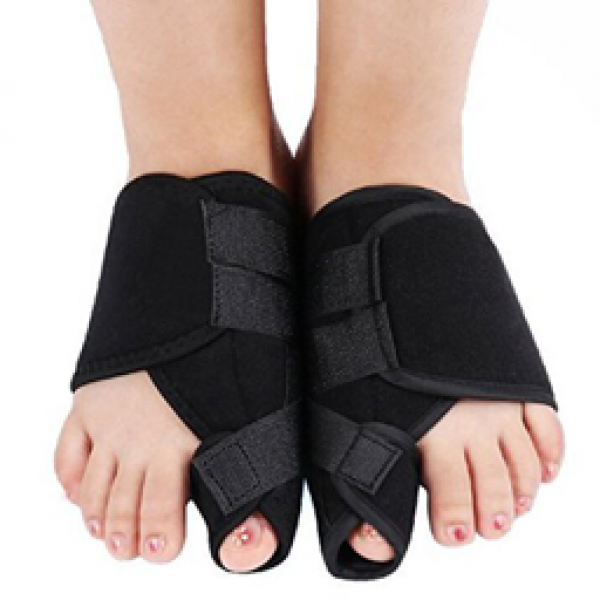 It has Velcro straps that help the brace get a firm grip on your toes. After wearing these for a short week, I’m beginning to see impressive healing results on my feet! Great product and certainly worth the money. Bunions can be really painful if you don’t take care of them and can cause you a lot of foot problems . This fantastic Bunion Brace has great support for the big toe and it covers the bunion and a portion of your foot. The brace stays in place with a velcro strap. The size of the brace is nice and convenient making it accessible for me to wear with slippers. It protects my bunion from rubbing against my slippers. These braces are very durable and the material is washable-which is fantastic! It’s easy to assemble and apply. It does it’s job with alignment and is not too bulky. I walk around the house and sleep in them. At first, it felt a little funny putting the splint on. But after walking around in them, my feet adjusted to them and I almost forget that I’m even wearing them! Bunions are so painful, I can really get annoyed with my feet sometimes because of them. I wore high heels for a long time, and I believe that is what caused mine. These Dr. Rogo Bunion Splints by Dr. Rogo are helping with my pain. When I first put them on it took me a minute to adjust them so they could do what they are supposed to do, but now I have the hang of it. They keep my big toe pulled back in the direction it’s supposed to be pointed. 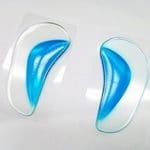 They are very soft, none of the velcro on the splint touches your foot. I can’t wear these while wearing shoes because they are kinda big, so I’ve mainly been using them at home.